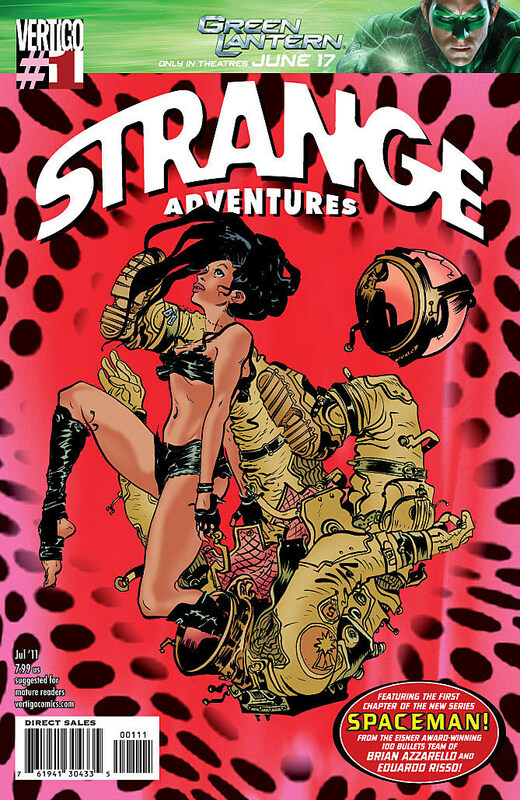 This week sees the release of Vertigo's Strange Adventures anthology, featuring eight eight-page standalone sci-fi stories by creators like Paul Cornell, Peter Milligan and Jeff Lemire, plus an eight-page prelude to the next creator-owned opus by the 100 Bullets team of Brian Azzarello/Eduardo Risso, Spaceman, scheduled to start this fall. If you like sci-fi brain-teaser short stories by a murderer's row of creators old and new alike, this is a solid $8 investment. 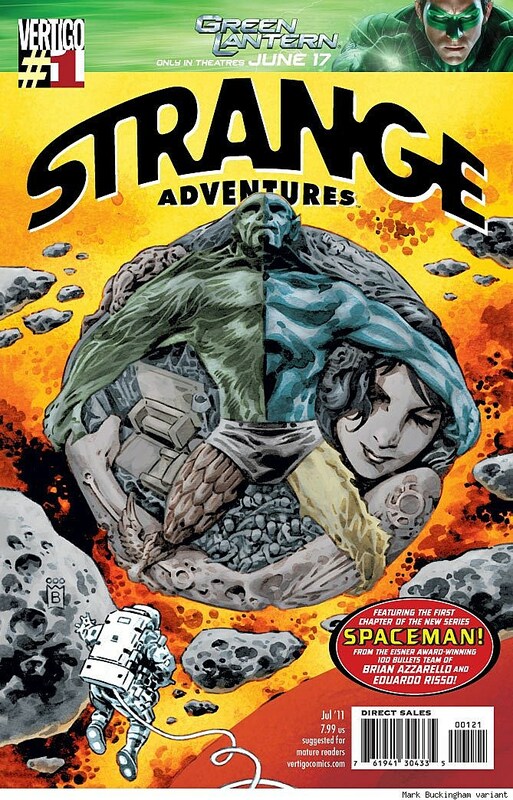 We've got several teaser pages and a table of contents for the included stories.While Strange Adventures is a mixed bag -- as anthologies tend to be -- the highs are high, and the art is superb throughout. 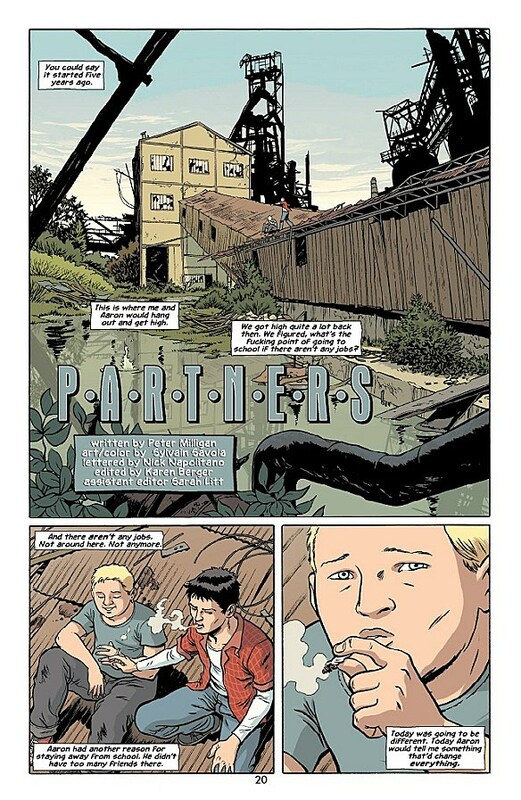 Particularly excellent are Kevin Colden's disturbing and chilling "Postmodern Prometheus," Jeff Lemire's gorgeously laid out "Ultra the Multi-Alien," Peter Milligan and Sylvain Savoia's Twilight Zone-esque "Partners" (previewed below) and, of course, the prelude to the new Azzarello/Risso joint, which takes eight pages to perform an act I'm not used to from Azzarello: sci-fi worldbuilding. 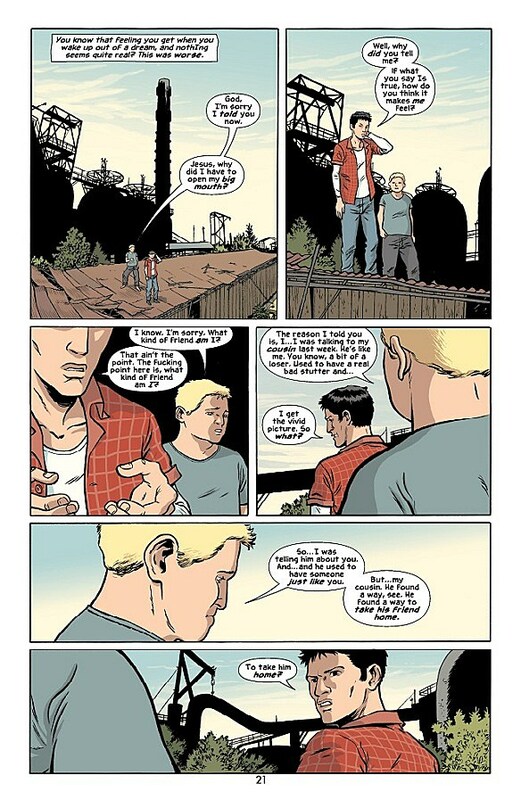 Particularly notable is Azzarello's manufactured future lingo, reminiscent somewhat of the Mutant dialogue in Dark Knight Returns, and oddly reminiscent (at least to me) of the culture shock I (and many other readers) experienced when reading the street lingo in the first arc of 100 Bullets. 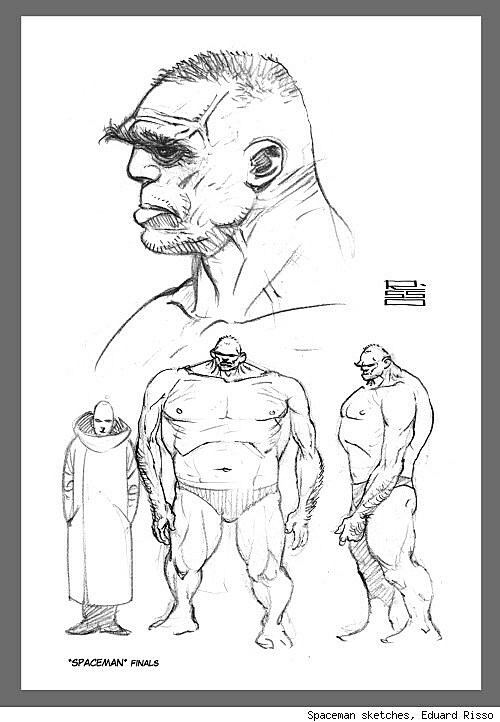 Sample text: "I'm AWED, tho, bubba, you unawares of the satee 'bout to go junk on the city. Was WEB-wide." The dialogue is clearly intentionally obtuse in a way that mirrors the first arc of 100 Bullets; however, after his fantastic work on that series, I'm willing to put in the effort to immerse myself in the world he's building. 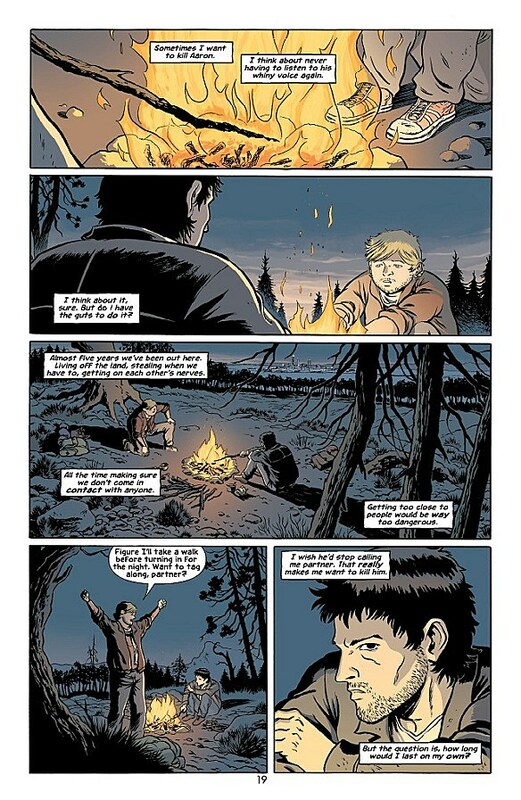 By the second or third arc, I imagine reading the dialogue will be second-nature, and it's certainly a testament to the effort Azzarello's putting in.